Urticaria with burning and itching. Better from heat, worse from cold. Urticaria with chill and fever. Urticaria from eating prawns, crabs. Urticaria with stinging, burning, smarting, pricking and itching, redness and shining. Urticaria like bee stings or stings from other insects. Body covered with large, elevated white wheals. Urticaria may come as a result of cold or during the course of intermittent fever. The itching, burning and stinging are almost unbearable. Worse warmth and better from cold. Apis must not be used before or after Rhus tox. It is nearly identical with Apis and is indicated when the welts are smaller than Apis. It is, especially indicated when the urticaria occurs by eating shell-fish. It should be tried when Apis fails. It has the similar symptoms as in Apis, except it has frequent urination. (opp. of Apis). Nettle rash with intolerable itching and burning. 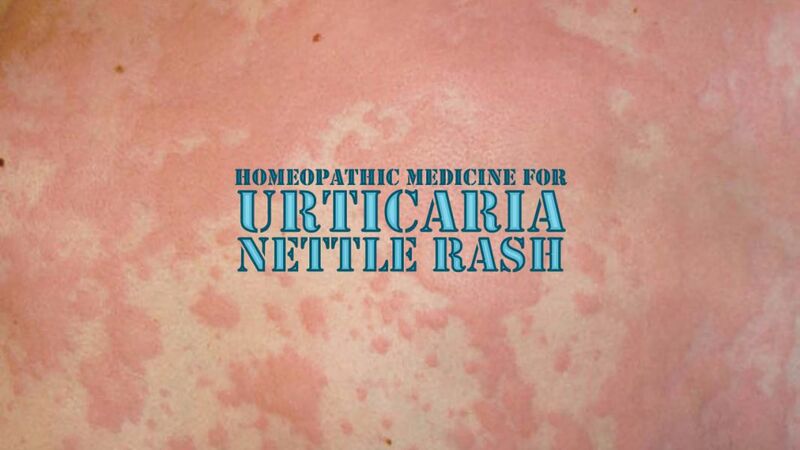 Urticaria worse after bathing, after violent exercise and from warmth, during rheumatism and better by rubbing. Eruption and itching disappear as soon as the patient lies down and reappear immediately after rising. Itching with burning. Relieved by warmth. It is nearly specific when urticaria is due to eating shell-fish. Suited to chronic cases. Urticaria which always disappears in the fresh air. Urticaria from gastric disorders, when there is relief from cold air. Eruption of white, irregular blotches raised upon the skin, surrounded by areola. Worse from warmth. Better in cold. Wheals itch, smart and burn. Very annoying itching about the joints, especially about the ankles.